If we learned anything from LadyDoritoGate, it's that women hate dumping chip crumbs into their wide-open mouths. But maybe this has nothing to do with keeping up appearances; maybe these savvy women are saving the crumbs for clever, delicious uses. 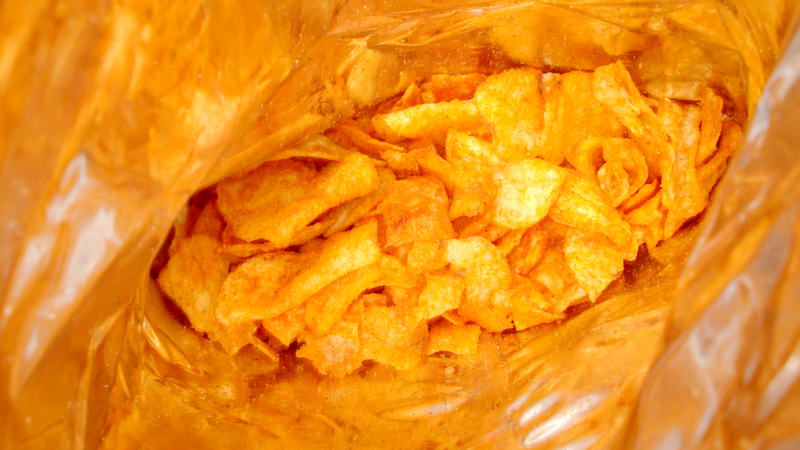 I can't speak for all women, but I don't know that I've ever tossed the delicious crispy crumbs from a bag of chips. Why would I, when I could use them in one of the below applications? Fold them in a Spanish tortilla: Though the original recipe uses whole chips, I don't see why your broken bits wouldn't work. Use them instead of bread crumbs: Anything you can crust with bread crumbs, you can crust with chip crumbs. Nacho Cheese Dorito chicken is quite good; just flour the meat, dip in beaten egg, and coat with pulverised chips of any flavour. Sprinkle them on a salad or a bowl of soup: They will add flavour and crunch to either one, and require no prep work, since they're already crushed. Top a casserole or macaroni and cheese with 'em: Every casserole needs a crunchy topping; add yours during the last five minutes or so of cooking so they don't burn. Put them in a sandwich: Do this especially if the sandwich you're eating is tuna or chicken salad. Those sandwiches often suffer from a lack of diverse texture, and bits of chips provide just that. I have also been known to dump the dregs of one chip bag in some sour cream, then open a new bag and use the fresh chips to eat the "dip". It's like chain smoking, but with chips. The last tip is the best. I call it 'dip cereal' and it is the best use of those pieces of corn chips that are too small to be held AND hold dip/salsa at the same time.